Homemade fried yeast donuts, topped off with a sweet maple icing and bits of salty bacon. An amazing combination that is an absolute must try. We’ve been in full blown Nashville marathon mode, or at least whenever a disc arrived. I’m not even kidding. We’d get a disc from Netflix and watch straight through the entire thing some nights or maybe two nights… that sounds more likely for the longer discs anyway. I’m both happy and sad that they’re only on the second season because we’re already catching up on season two and so close to being fully up to date… soon enough anyway! Truly addicted. So tell me… have you been watching? And if you haven’t, what are you waiting for? It’s really good. Of course, you have to enjoy country music and appreciate what they’re doing with the show. Singing and lots of drama in every episode. I guess drama is essential in a way. You get sucked in and left wanting more, wondering what’s going to happen next. So clearly it’s working. What are shows are you totally hooked on that I should look into? Once we’re caught up on this one, we’ll need another to get hooked on. Suggestions? I already did Friday Night Lights and Alias… both good! Now, these donuts. Yes. These donuts. Are necessary, just like drama. Sweet and savory food has it’s own kind of drama, or at least in my world because I totally 100% avoided it for as long as I possibly could and now I’ve fully embraced the amazingness that it is. These donuts are the essential splurge donut. 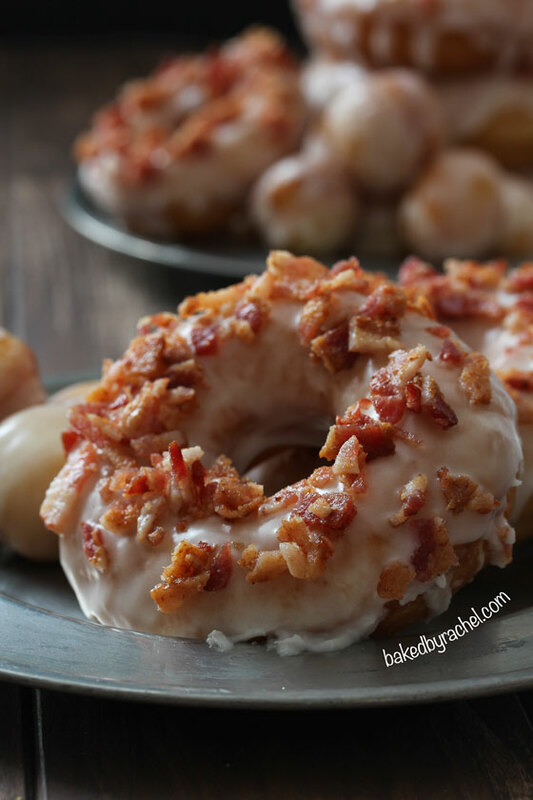 Fluffy fried yeast donuts topped off with a sweet maple icing and salty bacon crumbles… aaaamazingly perfect. I honestly wasn’t sure how my family was going to react to this one BUT the Mr enjoyed them and the girls… even the pickiest, loved these… WITH the bacon! I was in shock but you know what that means, right? If the entire family loved these, all ranges of taste preferences here, then they’re definitely a must make and share with your favorite people kind of donut. 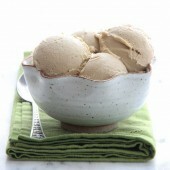 In a glass measuring cup, combine milk, yeast and 1 tsp sugar. Proof for 5-10 minutes. Meanwhile, to the bowl of a stand mixer, add remaining sugar, flour, salt, shortening, egg and vanilla. With mixer running on low-medium speed, slowly add yeast mixture. Increase speed as needed, mixing until dough comes together. Dough may be sticky. Lightly grease your hands and a medium bowl with baking spray. Shape dough into a ball, transfer to prepared bowl. Cover and allow to rise in a warm location until doubled in size, roughly 45 minutes. Prepare a baking sheet with a sheet of parchment paper, lightly greased with baking spray. Roll out dough on a lightly floured surface to between 1/4 and 1/2-inch in thickness. Cut out donuts using desired sized donut cutters (large or small. Transfer dough to prepared baking sheet. Allow dough to continue rising while heating oil in a large stockpot to 325°F, monitoring with a thermometer for accuracy. Fry 2-3 donuts at a time, cooking each side until lightly golden. Remove to a paper towel or wire rack. Repeat with remaining dough. In a medium bowl, beat together icing ingredients. Dip cooled donuts in icing. Immediately sprinkle with cooked, chopped bacon. Recipe yields roughly 6-12 donuts, depending on cutter size used. *Plan on roughly 3/4 to 1 slice of bacon per regular sized donut, give or take depending on how bacon covered you want them. I honestly didn’t think it got much better than cheesecake filled donuts…until you put maple, bacon and donut in the same sentence! These look incredible girl! Put bacon on anything and I am in….and, the hubby is going to be in even more! I really need to try Nashville. I just finished Friday Night Lights and going through major withdrawals! You should try Damages next… so good!! 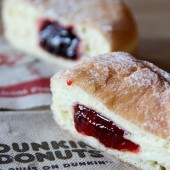 And now I am DYING for one of these donuts! A place right by our house makes a similar one and they are incredible! Oh girl! These doughnuts. I shouldn’t have looked at this before trying to get motivated to workout. Thanks so much Layla! Very sweet of you to say. Yeast doughnuts topped with mapley bacon. Yes please!! 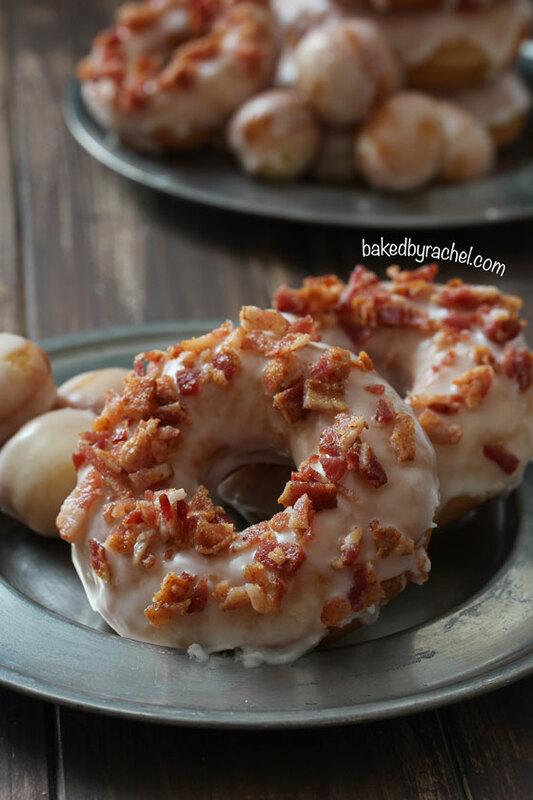 Maple + Bacon + Doughnut = Heaven! Love Nashville! I’m currently obsessed with American Horror Story, Walking Dead, Greys Anatomy, Modern Family, Parenthood and Once Upon a Time. I absolutely LOVED Friday Night Lights. So good! I can’t wait for Nashville to start up again! I tried Parenthood again recently and couldn’t even get through one episode lol I just don’t get it I guess. “Breaking Bad” we spent the whole Christmas and New Years break streaming each episode from Netflix, we almost made it to the end then discovered the last few episodes were only available on disc! they are on their way, should finish this weekend. What a show! I’ve been meaning to make a version of this donut for so long now! I’m not sure what’s been holding me back! These look amazing. Well clearly now you HAVE to because they’re amazing! Maple and bacon are my favorite sweet and savory combo! And on a doughnut? Yeah, heaven. Those look amazing! Yeast doughnuts are the only way to go. Those look insane, they remind me of the ones at Top Pot in Seattle. Maple bacon doughnuts are one of my favorite flavor combos!!! 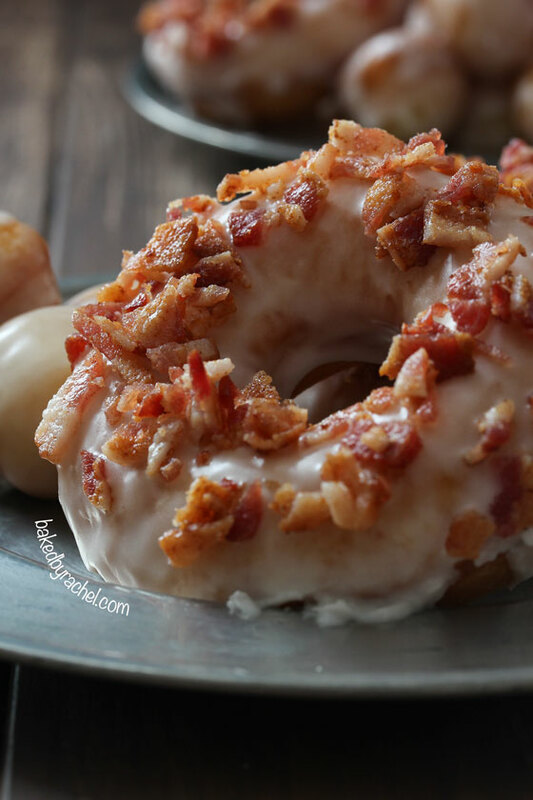 These maple bacon donuts are crazy delicious looking! I had my first maple bacon donut this summer and I can’t believe I lived this long without one. I cannot wait to make these for Art, I know he will love them! Oh and I’m super into White Collar and Psych. Both shows I love…and probably watch waaaaay too often. I feel like I’ve seen some of both of those shows. I’ll have to double check and see! 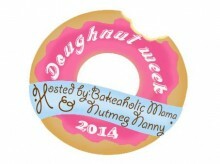 Donut week has been so much fun!!! 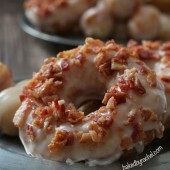 My kids would go crazy for a donut topped with bacon!!! 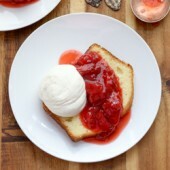 Is this recipe doable without the stand mixer? I don’t own one. Thank you! looks amazing. These were fun to make :) One thing, though… maybe I am not seeing, but where does the 1/4 c. of granulated sugar come in that was mentioned as being divided in the ingredients? These are quite good, but I am wondering if that 1/4 cup of sugar was supposed to be in there somewhere! The remaining sugar is mixed in with the other ingredients in the second step. I was wondering if I only want to use half of the dough, is there a way to freeze or store the other half for another time? Thanks! I haven’t personally attempted to freeze it but it’s certainly worth a try! Can these be made a day ahead? Do they do well in the fridge over night or is it best not to refrigerate? I’d like to make them for father’s day brunch tomorrow morning but don’t know if I’ll have time for all of it in the a.m. Thanks! I haven’t personally made them ahead so I can’t be completely sure how they’ll turn out. However, your best bet will be to prep the dough ahead, cut and chill overnight. Then you’ll need to fry and glaze them in the morning. Good luck! I made your recipe this weekend and the donuts didn’t have the consistency I had hoped for. When I read some other recipes I realized that a second rise was needed after the donuts were cut out. Why do you not have that step in your recipe? I think the texture of the donuts would be lighter and less cake-like if that step was taken. I had to add several drops of maple flavoring, in addition to more maple syrup to get a strong maple taste in the frosting. It tasted just the powdered sugar before making those additions. There is a second short rise listed within the recipe that should be plenty if your dough has risen properly. If your dough did not rise sufficiently during the first rise, you may need a longer rise. If this is the case, you may need to replace your yeast or the area you allowed your dough to rise may have been too cool or drafty. As for the frosting, as with nearly any recipe, taste is a personal preference. Some may like things stronger or more subtle, adjust to your liking. I made these for my boyfriend and they were AMAZING! I made the glaze differently (4 tablespoons unsalted butter, 1/2 cup maple syrup, 2 cups powdered sugar, 1 teaspoon salt, 1 teaspoon vanilla, 2 tablespoons milk), but the donut itself is the best I’ve tried so far. I’ve made them twice and both times they were wonderful. The second time I made them, I made the donuts at night and the glaze in the morning and they still tasted perfectly fresh. Thanks for the recipe! Please tell me why the first time I made these, they came out perfect, the second time not as perfect, but the third time they came out horrible? The dough didn’t rise at all, and the doughnuts were tough. I don’t understand, I did everything I did the first time.. *sad face* Not your fault Rachel, I’m just confused. Maybe a fourth time will do the trick. My best guess is you’re having problems with the yeast. Start by checking to make sure it hasn’t expired. And if possible, check your liquid temperature with an instant read thermometer to make sure it’s right around 115-120°F. Much hotter than that and it will kill the yeast, any cooler than that and the yeast won’t activate. Both of those issues will cause your dough to not rise. I don’t have shortening. Can something else replace that? Since it’s such a small amount, you could try butter since they’re often substituted for each other but I can’t promise you’ll have the same results. Good luck!